Throwing caution to the wind, I decided to try it anyway. And, wonder of wonders, it not only worked, but was super easy, practically foolproof, and the results were awesome! Step 2: Open avocados, remove pits. Step 3: Rinse slimy goo off pits, place in large saucepan with a good amount of water. Step 4: Put saucepan on stove over medium heat, walk away and forget about it. Literally. Step 5: Run across saucepan while getting a snack a few hours later and notice, with some surprise, that the water has turned a beautiful shade of deep pink. Step 6: Proceed to gather pretty much every white material in the house (fabric, lace, seam binding, Bristol paper, book pages, etc.) and dump it in the water. Step 7: Stop short of dunking white cat. 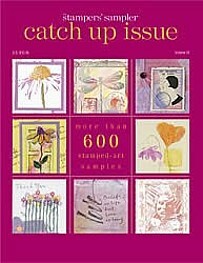 One caveat: Anything that starts out white will turn a beautiful shade of blush pink. Things that are ivory, off-white, etc. will not be quite as lovely. Some ecru lace I had turned a rather unpleasant 80’s shade of mauve, and a length of unbleached muslin came out considerably less bright and pretty than a white cotton. 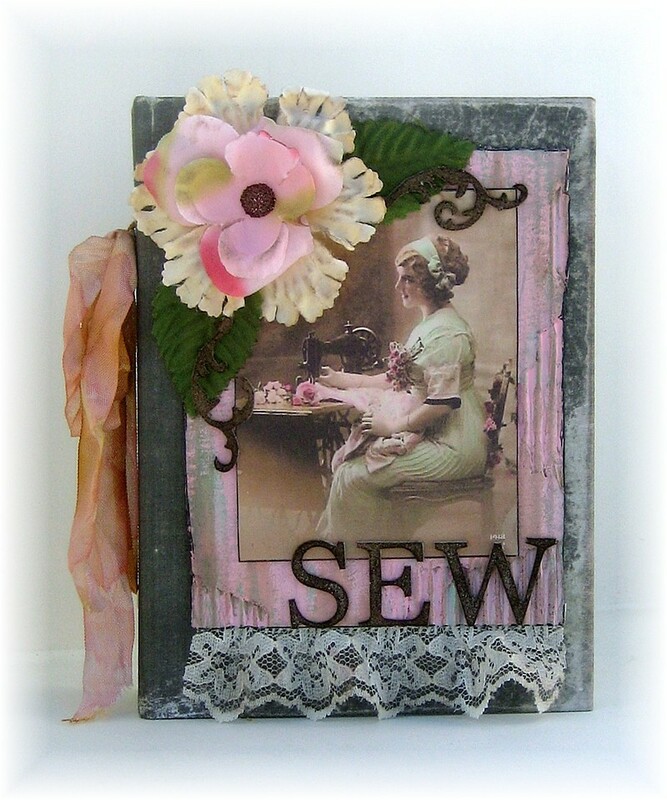 I was so happy with the results that I immediately sat down and started to work on a romantic, shabby-chic, girly, frou-frou, fussy, fluffy book. Using scrapbook paper that resembles old ledger pages as the base, I created nine 9″x18″ spreads, which resulted in a fat little 6″x9″ book. 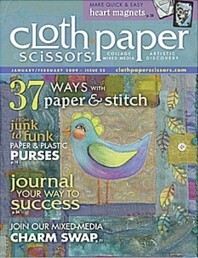 Each page features at least one element that has been avocado dyed. I’m still stoked that this worked so well, and the best part is, you don’t have to worry about caustic chemicals! The cover is heavy chipboard wrapped in the avocado-dyed cotton fabric, and I’ve added ribbons to the binding threads, made from avocado-dyed seam binding. The seam binding is polyester, so it didn’t take on the dye as easily as natural materials do, but I think the subtle pink is quite lovely! 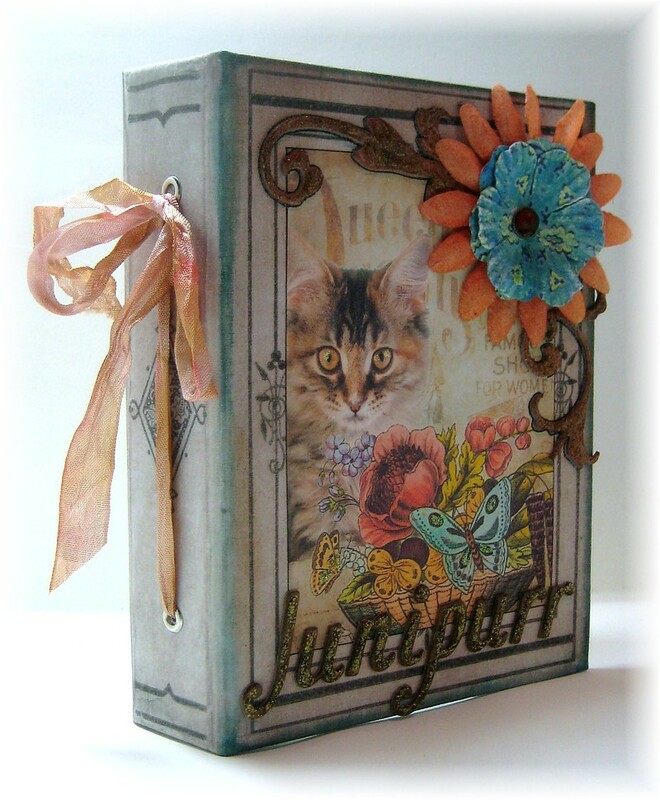 Everything was “grunged up” with Tim Holtz Distress Ink to add to the vintage flair. 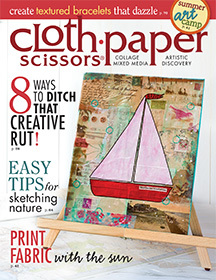 Many of the pages have scraps of tissue printed with sheet music, which is also a Tim Holtz product. I usually create with whatever is close at hand, and I had a lot of this stuff close at hand. Compendium of Curiosities Challenge #29! Can’t believe we’re up to 29 challenges already over at Linda Ledbetter’s! 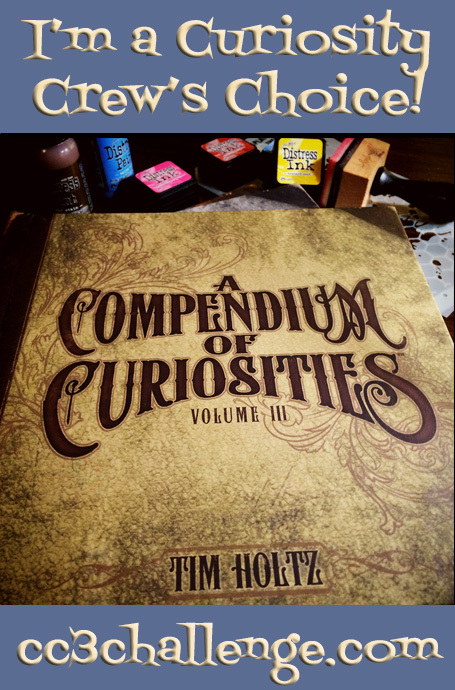 It has been so much fun to follow along in Tim Holtz’s third Compendium of Curiosities book, and while I’ve missed a few due to not having the right supplies or life just getting in the way (as it tends to do! ), I feel like I’ve gotten so much out of this book, thanks to Linda, and gotten to know so many great gals in the “Curiosity Crew” through their stories and artwork. 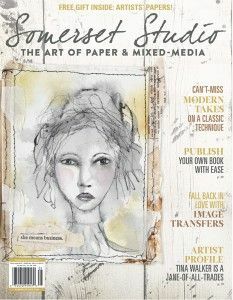 This time we’re turning to page 44 and learning the “Eroded Metallic” technique. There are several steps to the process, and the end result is awesome! I did the technique on a tag using the new Cracked Pistachio Distress Paint, which is a gorgeous color. I had a wee bit of trouble with the final step in the process until I changed up the way I was using the “tool” and then I really loved the results. Want to know more? Check out the technique in Tim’s book! 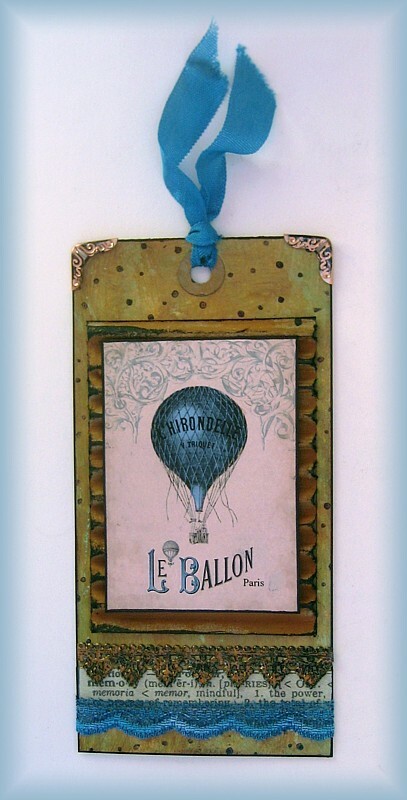 The balloon image is from Stampington; it’s one of my favorites. I mounted it on corrugated cardboard which I’d painted and swiped with black ink. Then used my favorite metallic Distress Paint, Antiqued Bronze, on some black Dresden, and stained a bit of white lace with Mermaid Lagoon and Stormy Sky Distress inks and added this to the bottom along with some tissue tape. I stamped the background with a “fairy dust” stamp (which is basically just random dots in various sizes) and then finished it off with copper colored metal corners. 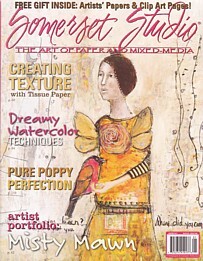 Have you been following along with the challenges over at Linda Ledbetter’s blog? 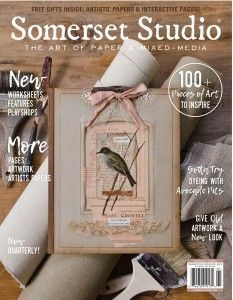 We’ve been working our way through Tim Holtz’s Compendium of Curiosities III book; there is fun to be had and prizes to be won! This time we’re turning to page 57 and learning how to do Alcohol Ink Ombre. 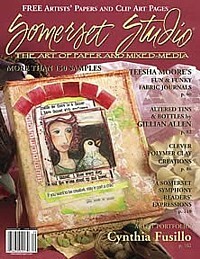 This challenge is sponsored by The Funkie Junkie Boutique and wouldn’t it be great to win a gift certificate? All you have to do is create something with the Alcohol Ink Ombre technique. Check out the Curiosity Crew’s great examples on Linda’s blog for inspiration. They always do amazing work! Admittedly I had some trouble with this technique at first. It came down to my reading the instructions and then, in my silly mind, replacing one simple three-letter word with another. Note to self: “tap” is NOT the same as “rub”! Once I re-read the directions and figuratively slapped myself upside the head for doing it wrong, I was able to achieve a very nice ombre effect. I made three pieces; one brown, one teal, one orange, and decided to use them all in one project. 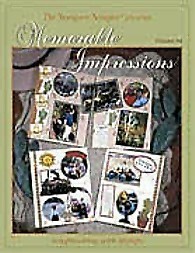 I pulled out one of my favorite Tim Holtz stamp sets; stamped one image on each color and colored one of the images with markers. The brown piece was attached to a black card and the others were adhered on top with foam tape for added dimension. 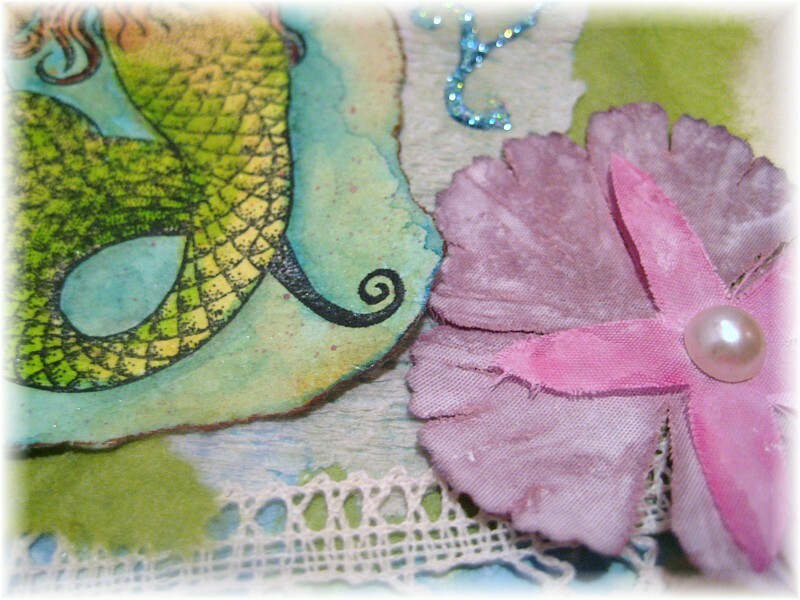 A couple of metal corners rubbed with Mermaid Lagoon Distress Paint completed the card. Once I figured out what I was doing, this was really fun and I love the ombre effect! I can’t believe there have been 21 challenges already! 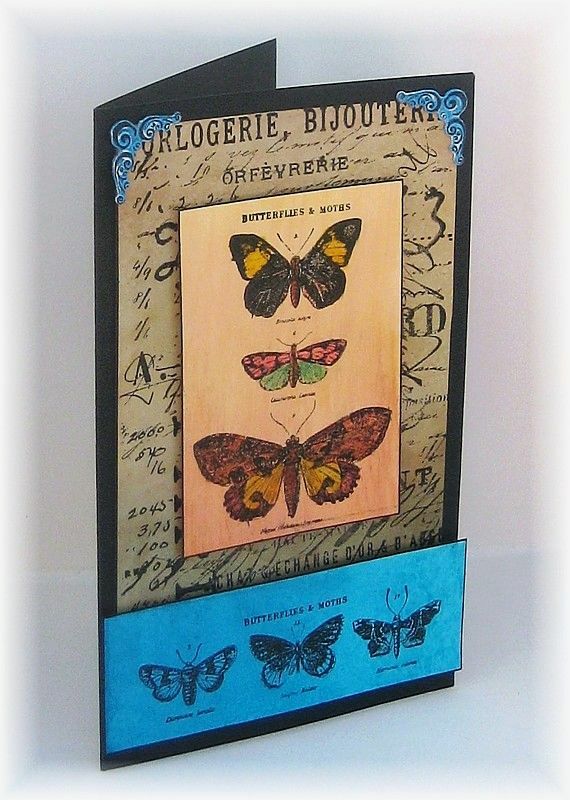 Linda Ledbetter’s doing a great job putting these challenges together, and the Curiosity Crew always makes such pretty examples of each technique from Tim Holtz’s Compendium of Curiosities III.So much inspiration! You can join in any time; and why wouldn’t you when there are prizes to be won! 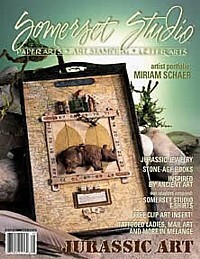 This time the sponsor is The Inspiration Emporium, and coincidentally, I am getting ready to place an order. 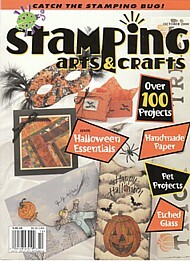 It’s so much fun shopping there; if you’re a Tim Holtz fan, they’ve got just about everything you’d ever want! 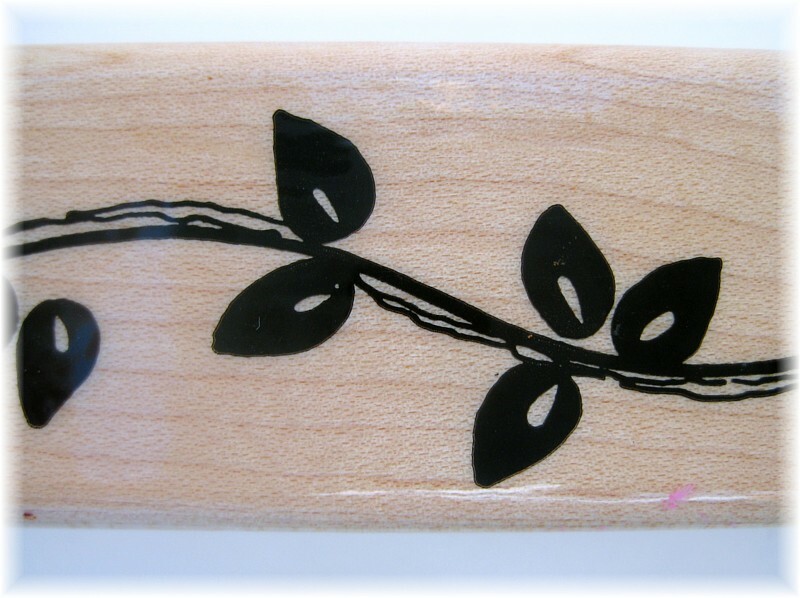 This is a close-up; the whole stamp is about 5″ long. I’m showing you the stamp because there’s no way you can tell what this image is in the final product! But it does make a great sparkly background. Like 99% of everyone else, I’m thinking of Valentine’s Day this week, so I went with that theme. Hopefully this closeup shows the sparkle at least a little bit. Rock Candy Distress Glitter is very chunky! I sprinkled a bit of “regular” glitter on as well to make sure all the areas were well covered. The round stickers are by Bo Bunny. 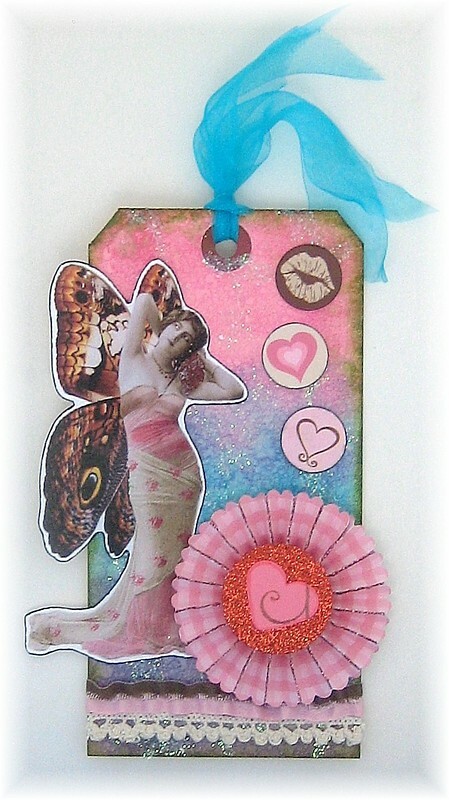 Using a Tim Holtz die, I made a pretty pink rosette to compliment the pretty fluttery lady. 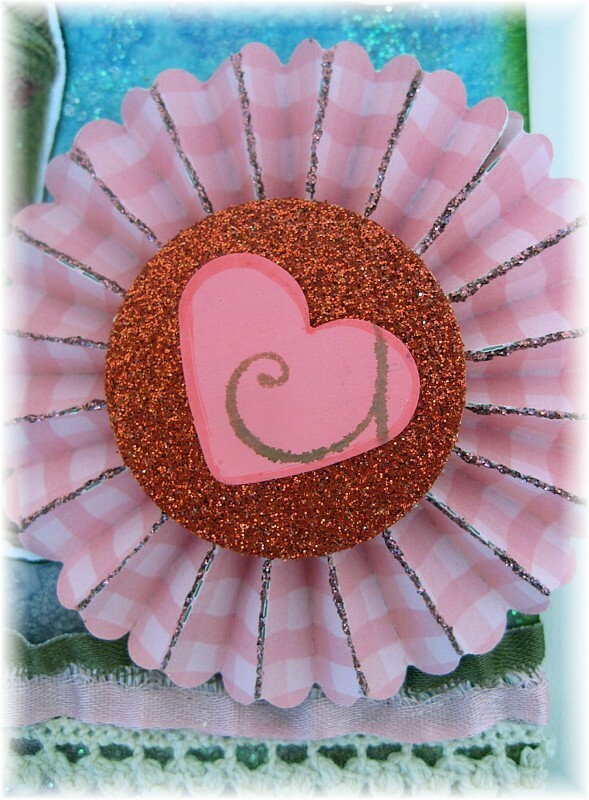 I punched the center from red glitter paper and added Stickles to the rosette edges. A bit of lace, ruffly trim and a sheer ribbon for the top, and this tag is ready for its Valentine debut! Once again I find myself getting a project done at the last minute! 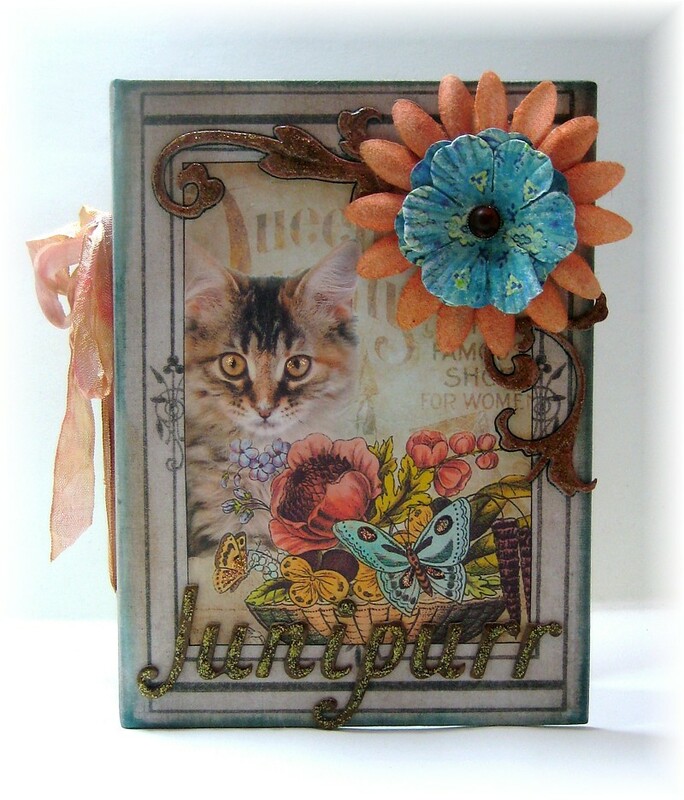 We’re having a blast at Linda Ledbetter’s fun and fancy blog for challenges based on Tim Holtz’s newest book, Compendium of Curiosities III. This time the sponsor is The Funkie Junkie Boutique, and what a great place to get all your newest artistic accouterments! We have turned to page 40 in our Compendiums and learned some useful additions to the watercolor technique. I love Tim’s version of watercoloring and don’t do it nearly often enough. 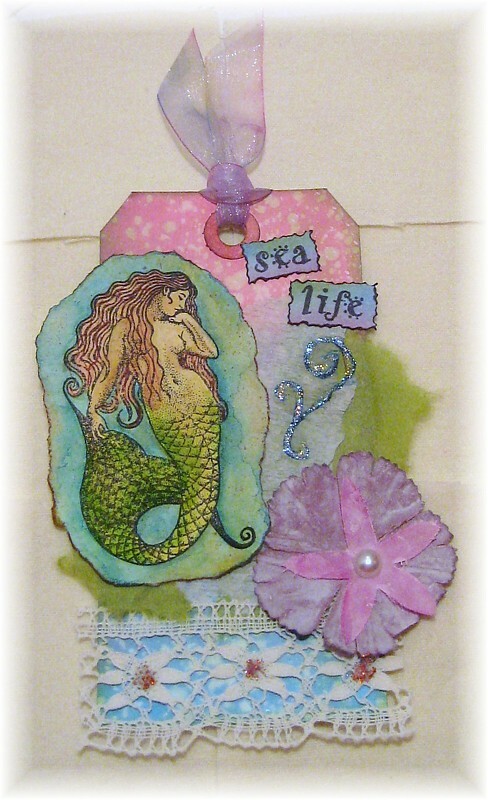 It was fun to pick out a stamp that would look great being colored in this fashion, and I quickly settled on one of the many mermaid stamps I have owned for many years. Unfortunately I can’t remember who makes this stamp (and forgot to write it down when I first bought it, as I usually do), but I just love her; she’s such a pretty lady of the sea! I used the technique as described in the book, adding some of my own special touches. When it came time for the spritzing, I masked off the mermaid’s face and most of her body, as I didn’t want any speckles there. After tearing the watercolor paper around her, I decided she was a good size for a tag, so I made the background on a tag with my favorite Tim Holtz background technique: cover it with various shades of Distress Ink and then spritz with water. I just love the look! As usual, the final touches had to be Stickles. (I have all the new colors on their way to me as we speak! I’m a Stickles hoarder/junkie/collector!) I mixed Persimmon Stickles with Ranger Glossy Accents to embellish the floral lace, and made a couple of flourishes with True Blue covered with Diamond to tone down the color a little. There are plenty of challenges left to go and loads of inspiration from the Curiosity Crew! You have two entire weeks to finish each challenge, so won’t you join us? Little did I know when I made a sewing journal for the Compendium of Curiosities challenge, that my comment about Challenge #13 being “lucky” was prophetic! 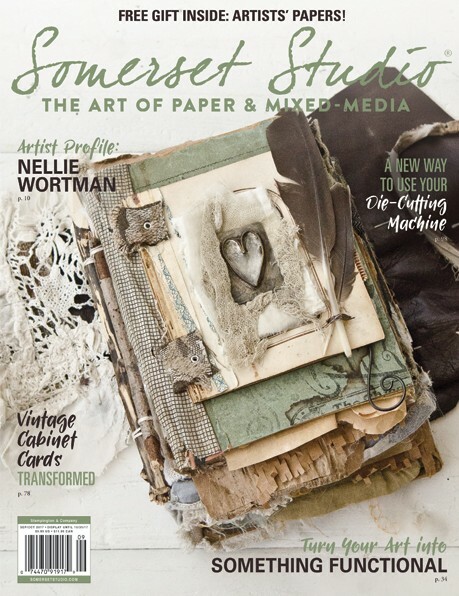 For, as it turned out, I won the random drawing in that challenge for a $50 gift card to Inspiration Emporium, whereupon I immediately purchased a whole bunch of Tim Holtz fabric. It’s still waiting in my fabric stash to be made into an amazing rag quilt. 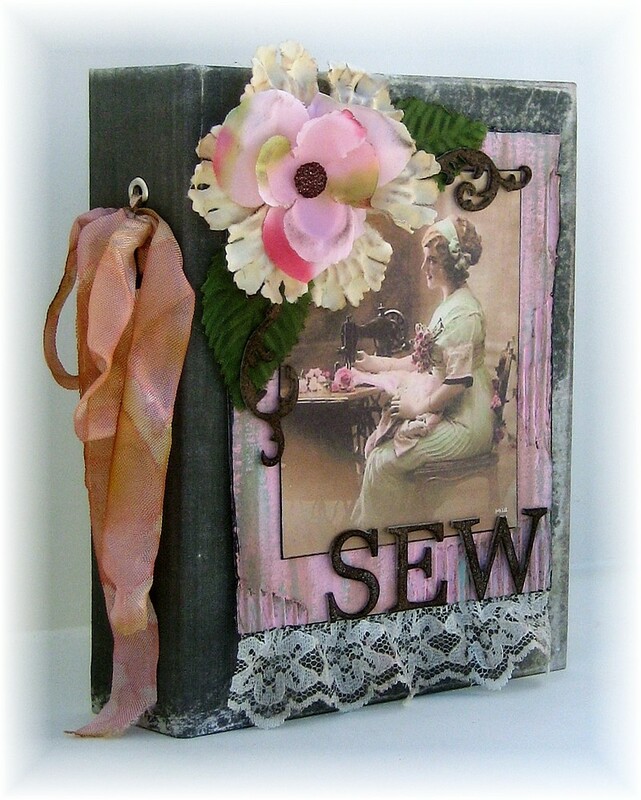 I made a sewing journal (here) because I knew I’d need another one soon. 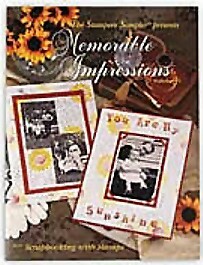 I was quickly filling up a blank book I’d found at the thrift store with photos, stories and fabric swatches and knew I’d need to expand into a second volume (at the very least). Last evening I decorated the cover and now my first journal is complete! 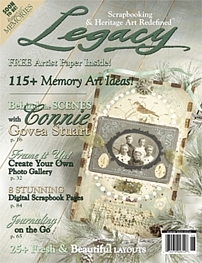 As with the first journal cover, which is going to be the second journal (yes, I’m confused), I used a photo of a pretty lady at her vintage sewing machine and added the word “SEW.” These puffy vinyl stickers started out glittery white; I used alcohol inks to help them match the rest of the embellishments. I left part of the background of the original book cover showing; it depicted an ancient Greek scene of two lovers (pretty people in togas!) with metallic silver swirls around the edges. I liked the edges and so left them bare. 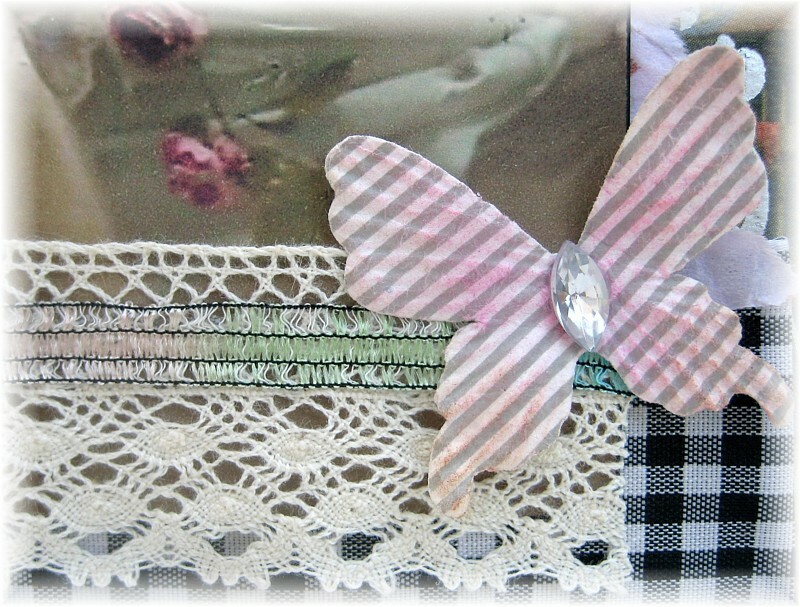 Along with the image of the lady at her sewing machine, I added stamped pink tissue paper, wide gingham ribbon, satiny ribbon yarn, lace, a beautiful silk flower, some Stickles swirls and a paper butterfly that I colored with chalk. I had trouble getting good pictures; it’s been overcast and rainy the past two days, so the photos came out a little “gloomy.” But you can still get an idea of the design, even if the colors are a bit muted. I love how “fat” this book is. 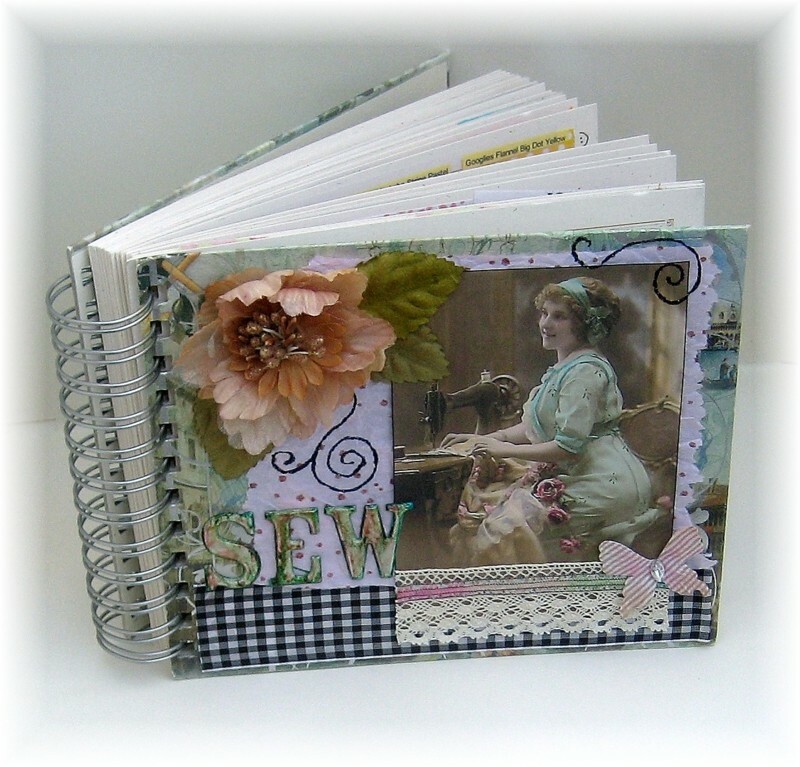 The inside pages are heavy cardstock folded over double with slits in each corner to accommodate photos. I had a great time filling it up with journaling and pictures of my rag quilts and rag bags and can’t wait to get started on the first one I made (which will be the second one)! I haven’t been able to participate in the last couple of challenges over at the incredible Linda Ledbetter’s blog (long stories, none interesting! 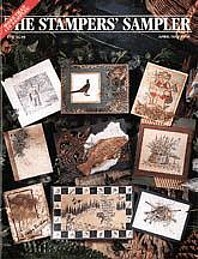 ), but I definitely had to make time for the newest, to use Tim Holtz’s Woodlands trees and/or Tinsel Twine in a project. 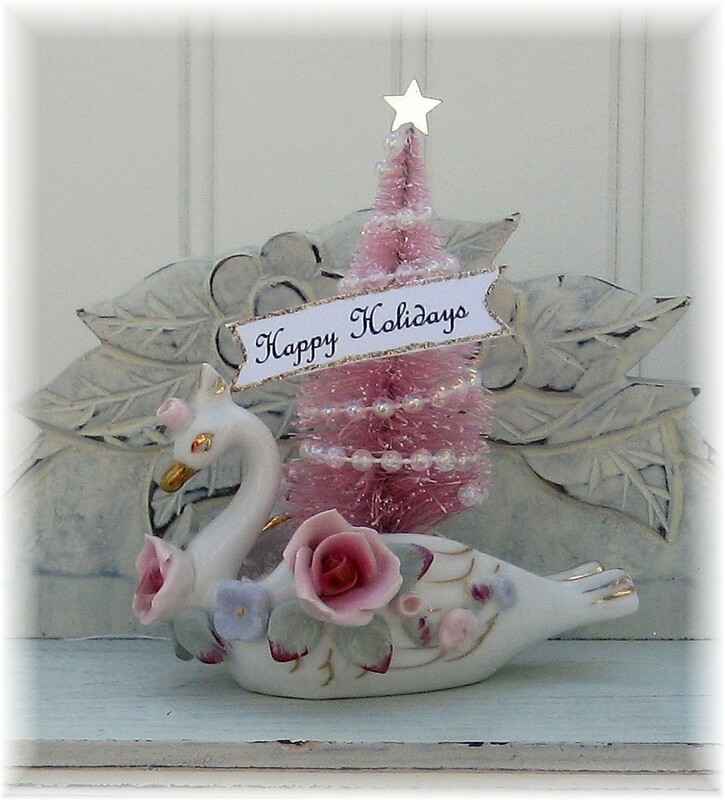 For some time now, I’ve been collecting vintage porcelain/ceramic vases, planters and ashtrays in the shape of swans, cherubs, deer and other pretty little creatures in sweet pastel colors. 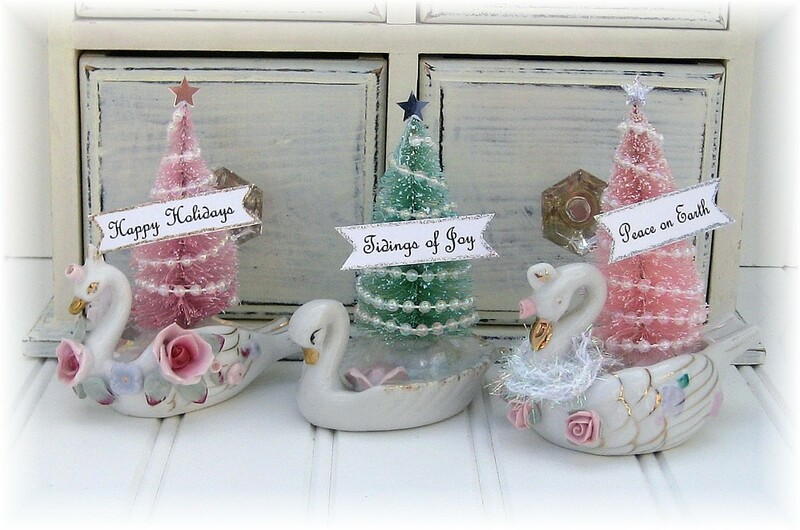 I love the look of shabby chic for Christmas, so I decided to fill some of the vessels with bottle brush trees with bead garland and mica-topped cotton batting for snow. 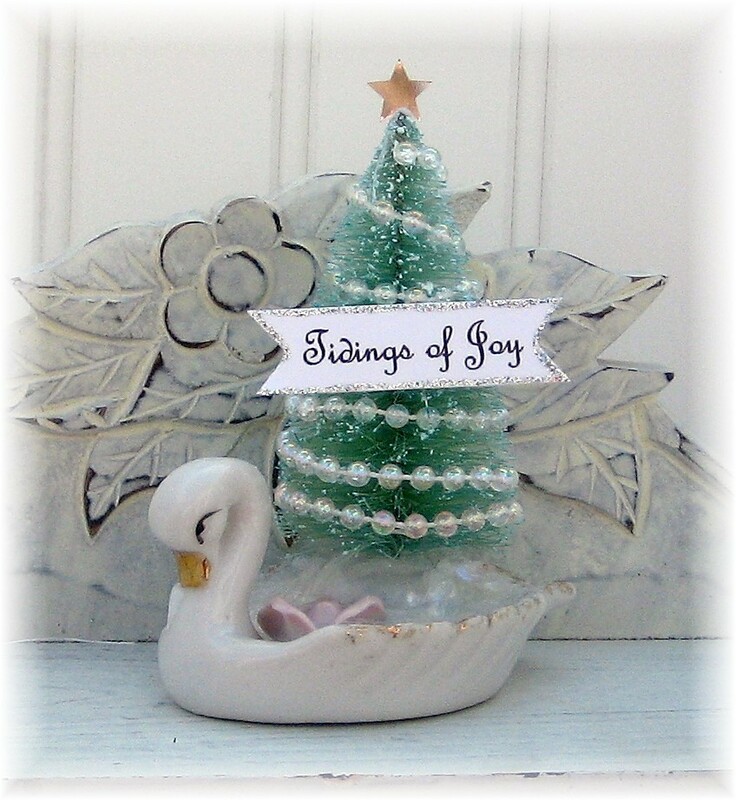 For this challenge, I picked three of my favorite swan-shaped pretties and used the Woodlands trees. I can’t share how I colorized them (check out the directions on page 60 of Tim’s excellent Compendium of Curiosities, Vol. III), but it was fun and quite satisfying! The stars are from a pack of confetti; just the right size for the top of the tiny trees. I typed up the banners and cut them out, then outlined with Stickles. (Because everything’s better with Stickles!) On this next one, I also added Stickles to the star. 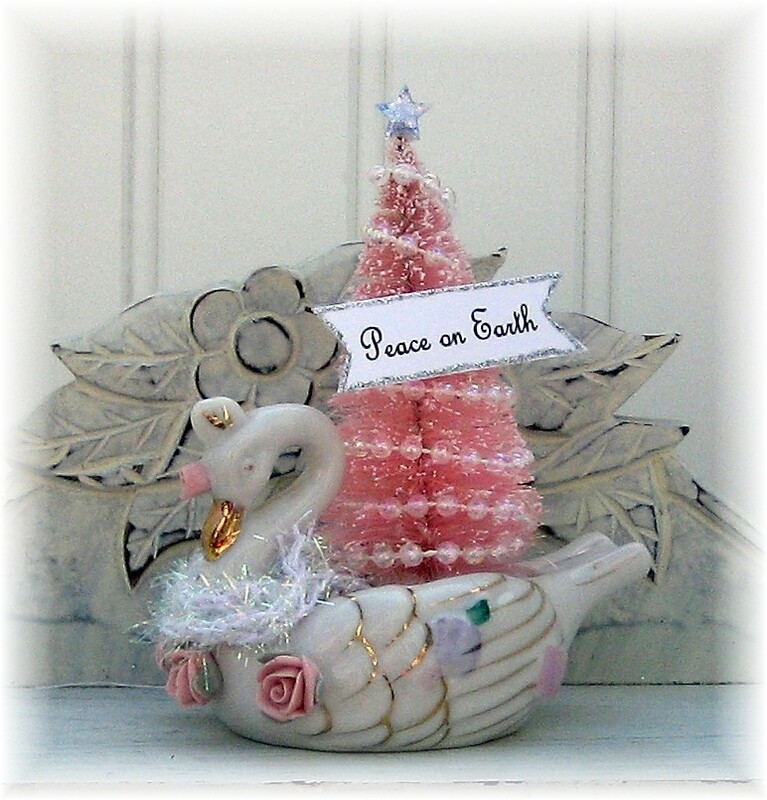 This particular swan had a little chip on his neck, so I wrapped some tinsel around to disguise it. Unfortunately I couldn’t find Tim’s tinsel in my local stores, so I made do with a fancy yarn from my stash that kind of looks like tinsel! So much inspiration over at Linda’s; the Curiosity Crew does Christmas so well! There’s plenty of time to join in the fun, and you can even win a wonderful prize from the sponsor, Inspiration Emporium! 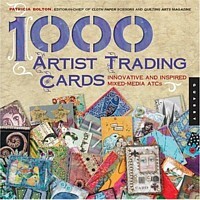 I was overjoyed to win this prize for Challenge #13 and had the BEST time shopping there. They have an amazing array of Tim’s (and other) products; I was thrilled to get some of his beautiful fabric and can’t wait to use it in my next quilt! At the last minute, I went ahead and made another album while I waited for the laundry to wash and dry. 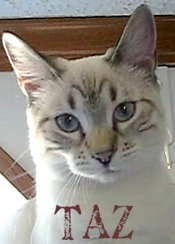 Our fluffy lil’ Junipurr has a lot of sparkle and sass, so I added lots of Distress Stickles to sparkle things up. 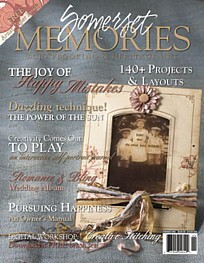 The flourishes are grungeboard colored with Tea Dye Distress ink and enhanced with Tarnished Brass Distress Stickles. 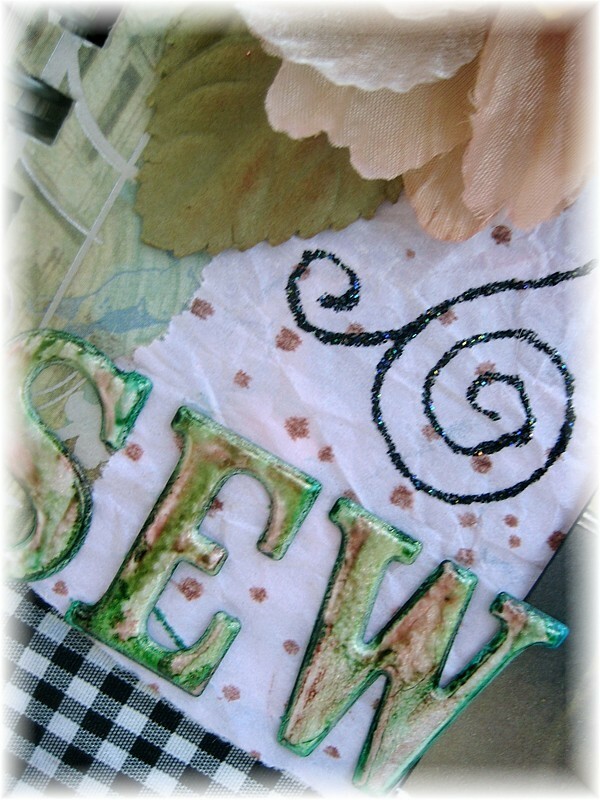 The letters are a stick-on alphabet that used to be striped green and yellow; I dyed them with Espresso alcohol ink and added Shabby Shutters Distress Stickles. Unfortunately these photos aren’t the best; it was dark when I finished and I had to use my Daylight lamp instead of the real daylight to photograph. 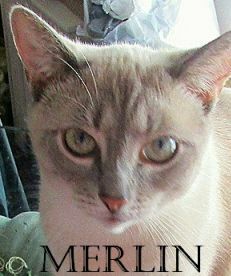 I look forward to filling it with pictures of cute lil’ Junipurr! Don’t forget to join us over at Linda’s for these fun challenges; you can win a prize from one of the great sponsors (this time it’s Inspiration Emporium), and get so much inspiration from the Curiosity Crew! 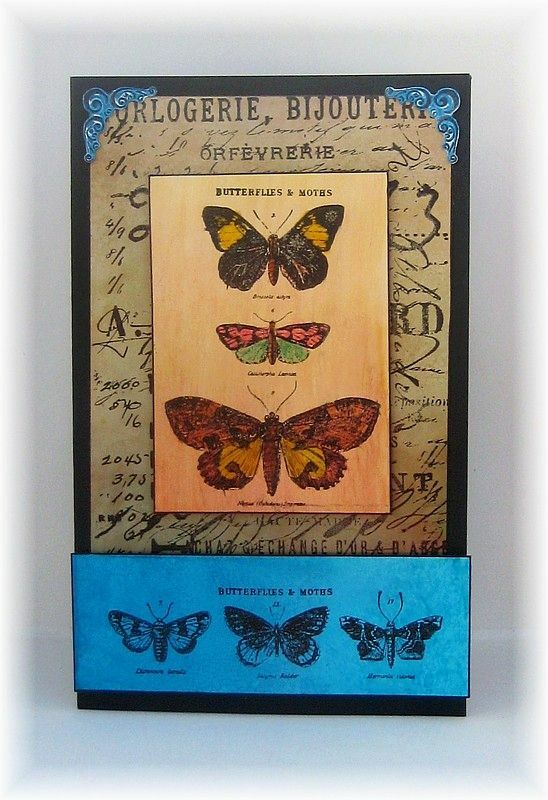 Over at Linda Ledbetter’s, we’re continuing the fun bi-weekly challenges of creating every project in Tim Holtz’s latest book Compendium of Curiosities 3. Each challenge is sponsored and prizes are to be won! 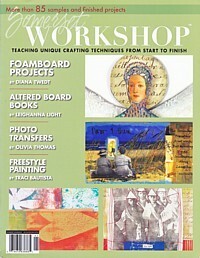 This time we are decorating Tim’s “worn cover” and the sponsor is Inspiration Emporium, with a very generous prize for the winner and a nice discount for anyone who participates! I learned to make rag quilts last month and once I knew it was going to become somewhat of an obsession (::ahem:: – WHAT giant fabric stash? 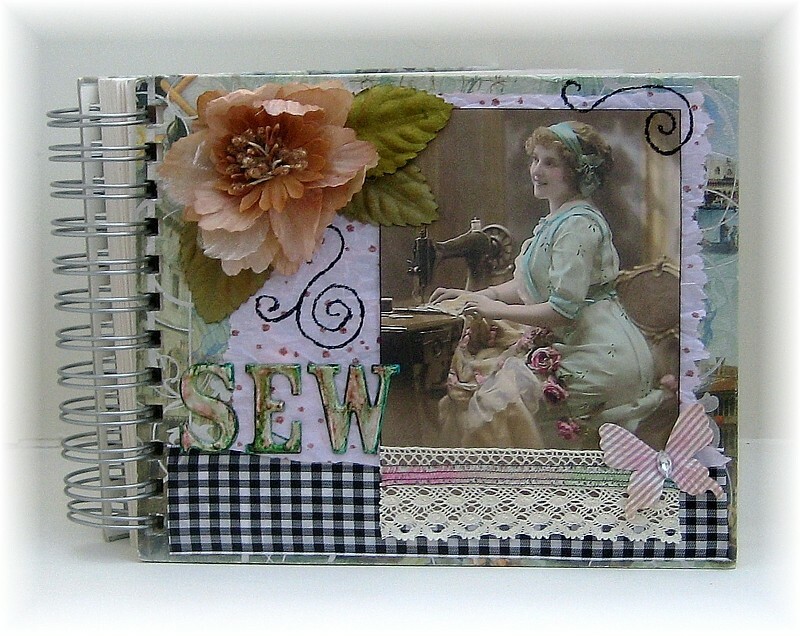 ), I decided to make a sewing journal to document all my projects. It’s almost full already, with fabric swatches, photos and journaling, so I decided a second volume is in order. Enter Tim’s Worn Cover and ring binder system. 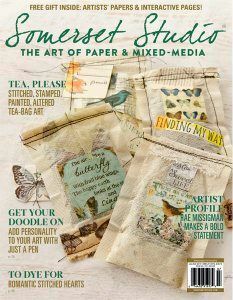 I just love the small size and thickness of these covers and that you can either add the ring binding piece or sew the pages in. Isn’t she just gorgeous? I love the flowers strewn about and the excited expression on her face. 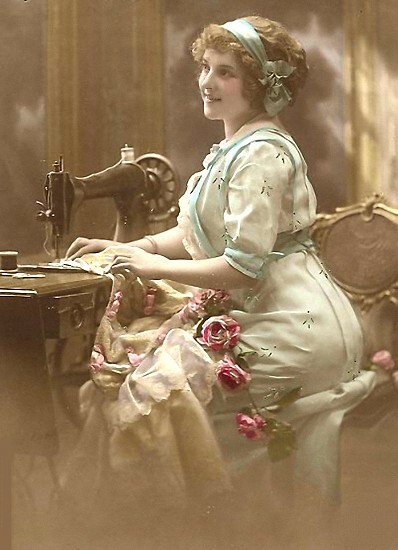 Probably I don’t have the same expression while I’m sewing (have to concentrate so I don’t stab myself too awfully much with pins), but I certainly feel it! I started by tearing and distressing a corrugated cardboard piece for the background layer, then painted it pink with mint green streaks. I used Walnut Stain Distress ink to color two grungeboard flourishes and letters. 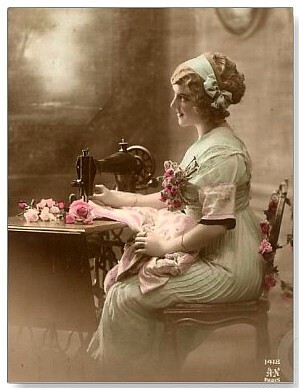 All that was needed then was a bit of lace and a flower. I tied the ring binder into the book with a length of seam binding that I’d colored with Vintage Photo and Worn Lipstick Distress Inks. Everything then got a good few swipes of the Walnut Stain ink to tie it all together and make it look well-used and grungy. The ribbon was still a little damp when I took the photos; it has since dried to a beautiful soft pink color.